Meet Wyatt, a senior fellow, but young at heart guy who is in need of a new home. When he was a young pup, he was bought at a Mexican flea market and came to the U.S. He had a couple different homes before he landed with his current family who he has been with for the last nearly  9 years. Sadly for Wyatt and his family, he is just not the right mix with young toddlers, he is "strange" with them. He is however just fine with older kids. Wyatt's family provides this info:  "Aside from his being uncomfortable with little kids, Wyatt is a typical dog! He LOVES to be outside all summer long and will dig a hole occasionally. He is a great watchdog and will let you know someone is at the door and alert youto the mailman, bicyclists or anyone on a skateboard! Wyatt gets along with some dogs, but not all. Wyatt is a big cuddle bug! He is trained to stay off the bed and couches but he is content with any doggie bed to snooze all day long on. Wyatt loves to be inside as much as he loves to be outside; it all depends on the weather I suppose. Taking walks is a must! Car rides are optional and not necessarily Wyatt's favorite. Sometimes the car ride stresses him out and he makes a crying noise., but eventually he will simmer down. Wyatt will eat your food if unattended and drink your coffee!, but he will NOT go through the garbage or chew on anything other than his toys and chew treats. I wouldn't leave the garbage without a lid but who does that anyways with dogs!? He is house trained and very well behaved. Never have we ever had any troubles with Wyatt relieving himself inside the house as he will  patiently wait for you to return home from work to let him out. Unless you have a gated or fenced in yard it is recommended to keep Wyatt on a run or leash, otherwise he will be down the round chasing a squirrel, cat, or bunny. Please open you hearts and homes to Wyatt as we need to find him a new family to care for him as our growing family can no longer." 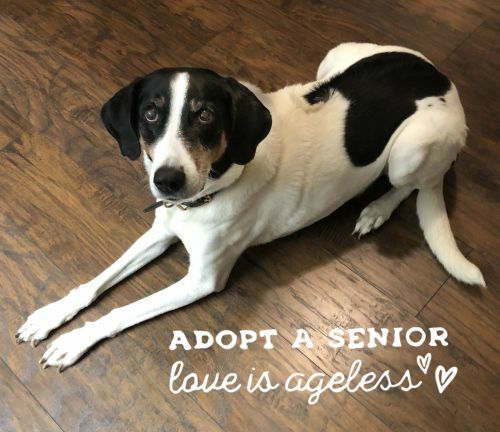 Wyatt is still in his home, but if you think you might be interested in adopting, your first step should be to complete an adoption application which you'll find under each dog's photo. Here is the link to the gallery of dogs waiting for homes. http://www.caninerescue.org/available-pets/   We do adopt out of state, however we do not transport or ship dogs. Potential adopter must be able and willing to travel to the Rescue to meet the dog they are interested in.